In a brief but ridiculous video clip posted on his Facebook page, Phil Robertson of Duck Dynasty gave his audience a vocabulary lesson while reminding them that the Bible, if used properly, could prevent murder. The implication was that the gun next to him had nothing whatsoever to do with murder. [Points at gun] So I have here an earthly weapon. It’s a firearm. I would never want to use that against another man. [Picks up Bible] This is also a weapon. It’s called a sword — the sword of the spirit. You want to stop murder worldwide? You’re focusing on the wrong weapon. [Picks up Bible] This, this will stop human beings from murdering one another. Real cute. And real dismissive of our nation’s problem with firearms too easily accessed by people who shouldn’t have them. 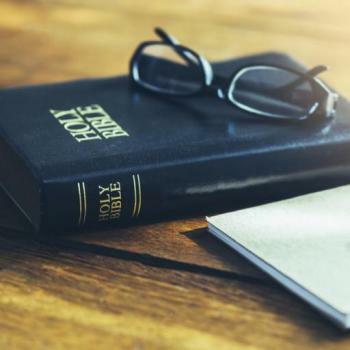 We know the Bible has been used to justify violence throughout history — and we know that the Bible itself has no shortage of stories of people killing other people with the weapons of their time — but when it comes down to it, the Bible is a book. Its purpose is to be read. The only way it’s going to stop a murderer is if you throw it hard enough. At the risk of being painfully obvious, a firearm has one purpose, and that’s to kill. If our secular laws don’t stop a murder, a Commandment’s not going to do it either. To compare these two objects, especially when “sword” is clearly metaphorical, is just insulting to everyone who’s been murdered by guns. With logic like this, no wonder gun violence continues to be a problem in this country.